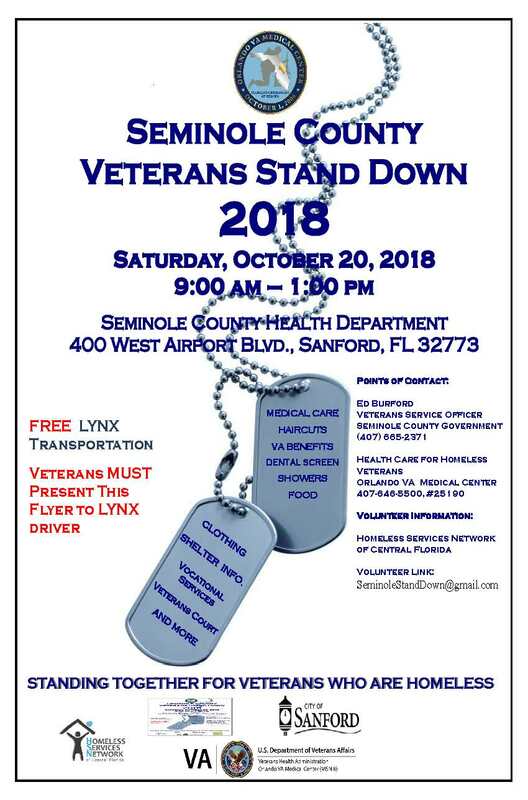 This Month on Saturday, October 20, 2018 the Seminole County Veterans Services will hold their 7th Annual Veterans Stand Down. It will be held at the Seminole County Health Department (400 W Airport Blvd. Sanford, FL 32773) from 9 AM to 1 PM. At this event, resources will be provided to homeless and at-risk veterans, including dental services, haircuts, medical care, showers, food, shelter information, and more. Lynx will be providing free transportation to the event if you show them the event’s flyer. SCBALAS will be in attendance to provide information and resources for veterans who need assistance in family-law/related issues. Please contact Ed Burford, the Veterans Service Officer, if you have any question. Mr. Burford can be reached at 407-665-2371.